Male and female, 18 to 28 years old; With experience in similar role; Must be fluent in English language. Candidate must possess at least a high school diploma; At least 18 years old; Must be computer literate; Has competent skills with Windows program; Has keyboarding skills of 50 words per minute (wpm); Must be willing to cancel offs and render overtime work. Candidate must possess at least a bachelor’s/college degree or professional license in Nursing or equivalent; Has good verbal and written communication skills; Must be computer literate; Can work under limited supervision. Female, 20 to 30 years old; Must possess at least a Bachelor’s/College Degree in Psychology/ Business Administration/ Human Resource Management/ Office Administration or equivalent; With at least 3 to 6 months of work experience in office setting; Must be proficient in MS Word, Excel and Power Point; Must be internet savvy; Must be fluent in English, both spoken and written; Has good phone etiquette. Male and female, 20 to 28 years old; At least high school graduate or college level; With at least one(1) year experience as Gasoline boy; Must be customer service-oriented; Must be willing to work on shifting schedules including Sundays and holidays. Male, 25 to 40 years old; At least 5’5” in height; At least college level; With at least two(2) years of experience as Security Guard; Must be trustworthy and customer service-oriented; Must be physically fit; Must be willing to work on shifting schedules including Sundays and holidays. Female, 20 to 35 years old; At least college level; With pleasing personality; With at least one(1) year of relevant work experience; With knowledge in using POS machine; Has good interpersonal skills; Must be customer service-oriented; Must be willing to work on shifting schedules including Sundays and holidays. Male, 20 to 30 years old; At least college level; With at least one(1) year of relevant work experience; Has good interpersonal skills; Must be computer literate; Must be customer-service-oriented; Must be physically fit; Must be willing to work on shifting schedules including Sundays and holidays. Male, 18 to 45 years old; At least high school graduate or college level; Preferably with vocational diploma in Automotive; With at least 6 months of experience in similar job; With knowledge and skills in light and heavy vehicle troubleshooting; Must possess a valid driver’s license. Male, 25 to 45 years old; Must be a holder of a valid professional driver's license, with restriction code nos. 2, 3 & 8. Candidate must be a graduate of BS in Civil Engineering, preferably with professional license; With at least 3 to 5 years of experience as Project Engineer/Manager specializing in civil/ construction/ structural engineering or equivalent; With skills and specialization in project management and material procurement; Must be good in quantifying and costing; Has competent skills with MS Office suite; Has a good leadership skills; Must be results-oriented; Must be capable of handling multiple tasks; Must be willing to be assigned to Mariveles, Bataan. Male, 25 to 40 years old; At least college level/graduate of Hotel & Restaurant Management, or with high school/vocational diploma with equivalent experience and training/s; With at least 1 year of cooking background specializing in Filipino cuisine; Must be trustworthy and with good working attitude; Must be willing to work on shifting schedules. Male, 20 to 30 years old; Must possess at least a high school diploma; With at least six(6) months of experience as Steward in a restaurant; Has good working attitude; Must be willing to work on shifting schedules. 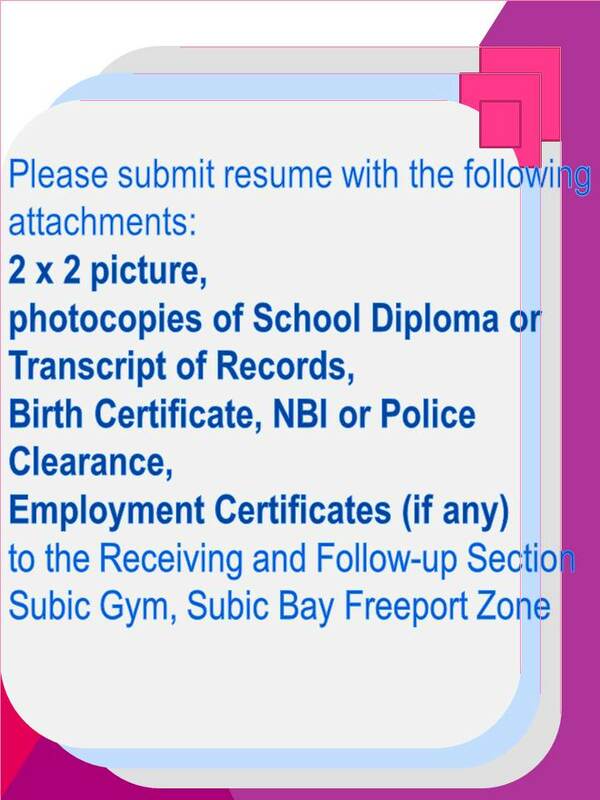 MEGA SUBIC TERMINAL SERVICES, INC. Male, not more than 38 years old; At least college level; With at least 2 years of relevant work experience; With good driving record; Must possess a valid driver’s license, with restriction code nos. 1, 2, 3and 8; Must be flexible, dependable, time-conscious and able to move from project to project with minimal supervision; Must be a non-smoker; Preferably a resident of Olongapo City or the nearby Bataan-Zambales municipalities. Male, 21 to 30 years old; At least college level; With at least 1 year of warehousing experience is desirable; Must be a non-smoker; Preferably a resident of Olongapo City or the nearby Bataan-Zambales municipalities. Male, 25 to 35 years old; Graduate of any relevant vocational courses; With at least 2 years of experience in the same position; Must be a non-smoker; Preferably a resident of Olongapo City or the nearby Bataan-Zambales municipalities.